We are in the last week of our time here. On November 4 we fly back to California (except for Dambara who is joining a pilgrimage in Israel before returning to Oregon). We leave the night on the 4th and arrive the morning of the same day, getting back what we lost on the way over. We are with Kavita and Aroon again in Hamilton. Last weekend we had a Saturday retreat, Sunday service, and then a talk on “Happiness” at the local Theosophical society. Tonight we have informal satsang. We were warned in advance that New Zealanders are more “British than American,” meaning more reserved. They have to get to know you before they’ll ask questions or share experiences. I scheduled classes for 2.5 hours -- a lot of time for a lecture, just right when people interact and engage. Sometimes it worked. In Wellington the time flew by. By the end of the first weekend in Hamilton, the audience was contributing more. Informal satsangs are going well. 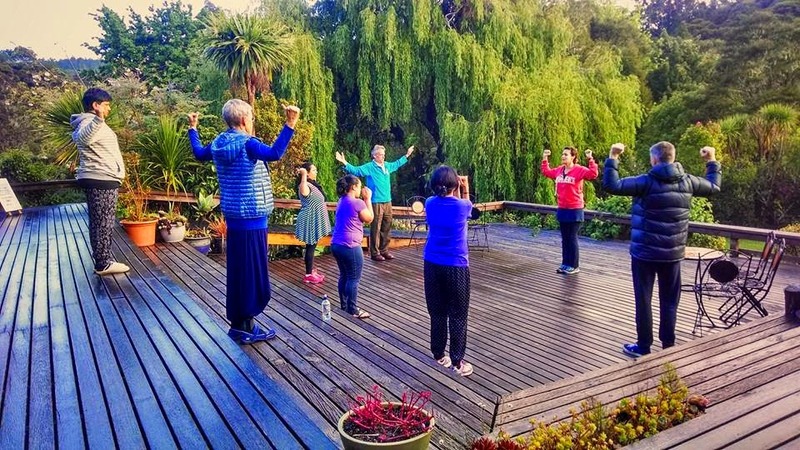 Since Palmerston North, we’ve included more music, chanting, and meditation. Probably the best idea from the start, but I’ve had to learn by doing. Nice to be able to answer those questions: Coasting: No. Learning: Yes. Swamiji set the example of creatively serving God and Guru to the last breath. Just weeks before his passing, he finished his last book. I want my tiny feet to follow his mammoth footprints. As I rounded the corner of 60 years -- and kept on going -- I wondered how to stay spiritually dynamic to the end. “Yes,” Swamiji said. My concern was justified. The ideal Indian lifestyle brings everyone to sannyas in their last years. Walking off into the forest isn’t the model Swamiji set. Giving everything to God is. I had hardly reached the edge of the possible in 2008, but I wasn’t sure how to proceed. Nayaswami vows solved that nicely. 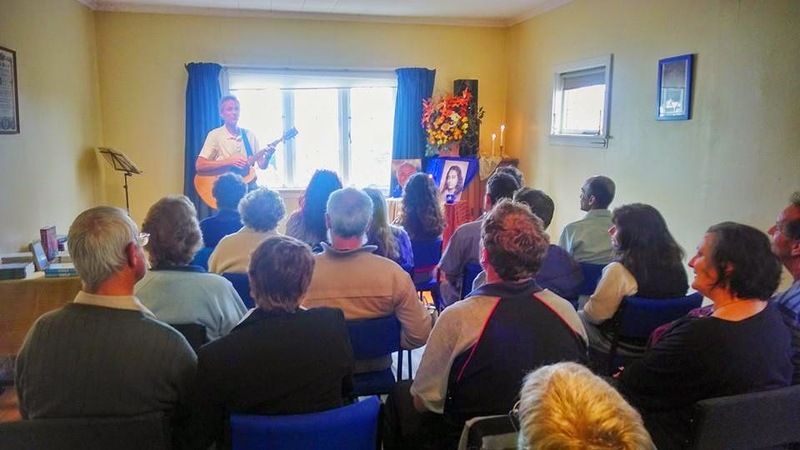 In Auckland, the venue Kavita chose is also a retreat center. We promoted it like any other class series. Though set in a secluded valley, the venue is close to town. People came and went for the various programs. All of us, though, and about seven others, lived at the retreat. Meals, sadhanas, and lots of time for conversation proved transformative. There is so much to Ananda. One hardly knows where to begin! My way is to give classes -- karma, reincarnation, meditation -- as much of the “Self-realization curriculum” as I could cover. Having Dambara to sing was essential. A few minutes of song can change consciousness more than hours of words. Still, even with lots of words, music, sadhana, and satsang, one barely touches the surface. For introducing Ananda to a new audience, Finding Happiness is a godsend. It is almost like being there. Everyone in the movie, and the ideas they present, expands the definition of what Ananda is and how to be part of it. On Friday, we go to Lake Taupo for a weekend retreat. About 20 have signed up, mostly people we have already met (plus two from Australia). Being together for three days we hope will launch Ananda New Zealand into the future. But it can inspire people to learn how to start one. Many times since we arrived here I’ve had to repeat this to myself: In one class, one weekend, one month we can’t teach everything about the spiritual path. But we can inspire people to want to know more. May we be able to awaken Thy love in all hearts: our constant prayer. As Swamiji often said, you can live next door to the best restaurant in the world, but if you aren’t hungry, you won’t go in. Fortunately, when spiritual hunger comes, in Dwapara Yuga, everyone lives next door to a spiritual smorgasbord. Passing out a directory of online classes, websites, and YouTube channels has been central to what we are doing here. In one of our programs, Dambara sang (exquisitely) some of Swamiji’s songs of divine longing -- like Through Many Lives, Mother of Us All, Divine Romance, Door of My Heart. People sometimes feel Swamiji’s music is sad. After the singing, I felt to comment. We place our tiny feet next to Swamiji’s giant footprints. In these last days, we’ve had time to be tourists. Rachel is a born tour guide and has planned marvelous excursions. We’ve bathed in geo-thermal waters, climbed to the base of a giant waterfall (and back up again), communed with amazing trees, climbed over rocks on a black sand beach. 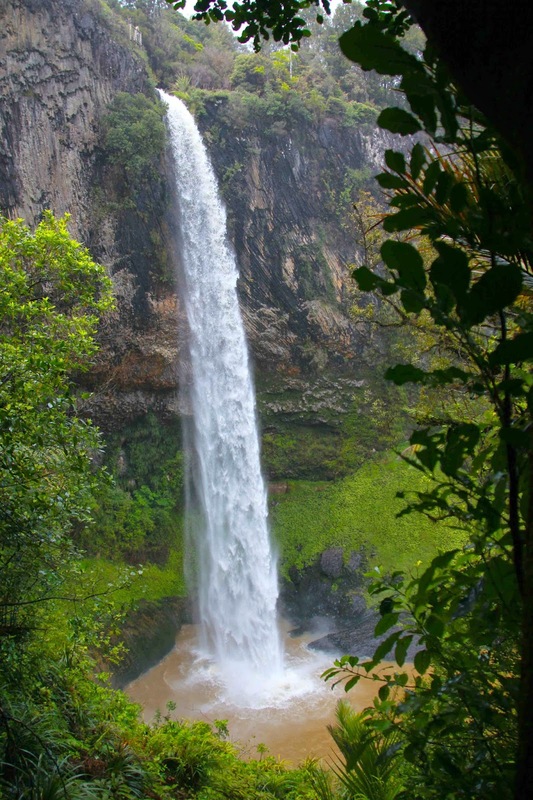 Mother Nature rules in New Zealand! And we bask in Her glory. 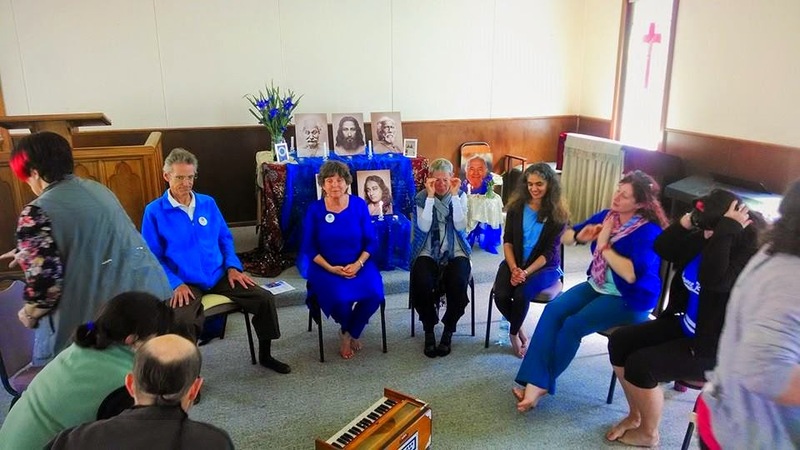 We are so grateful to God and Gurus for bringing us here, for re-uniting us with soul brothers and sisters, and letting us help launch Ananda New Zealand. Kiwis and Americans united in Master’s ray!